The purpose of the Atienza Kali Training Components is to ready the Atienza Kali Practitioner (AKP) for a real combat encounter. Each component plays a specific role in readying the AKP for combat. Utilizing only one of these components, without the others, will not ready an individual for combat. All the Atienza Kali Training Components, interacting together, are important for achieving that goal. Atienza Kali Tuhons have interacted with countless opponents over the last few decades. After some time the Tuhons began to see patterns of tactics and movements during these violent interactions. They classified these techniques and tactics into what would eventually be called Atienza Kali Fighter Types. In Atienza Kali every combatant falls into some these fighter types. Using fighter type interaction became an extremely effective way to determine (or create) an entry or counter against an opponent(s). Examples of deflector fighter type technique- Point up deflection to counter as attack comes in will usually move straight back or in a 45 degree angle. After moving usually roots into a 50-50 stance for a solid deflection so counter cut has a certain power. During deflection, the AKP makes sure the second third of his blade contacts opponents first third of blade so when blade passes after deflection he doesn’t get hit. High level AKP’s use all of these fighter types of combinations or fighter types. Influenced by the Sayoc transition drills, Atienza Kali Evolution (Evo) drills consist of attacks and counters that use techniques that never repeat themselves and the drill always ends. The Evolutions (Evos) are constructed by interacting all the Atienza Kali fighter types. They give the base interaction of how fighter types fight each other. The evolution disruption is an exercise that teaches the AKP the proper way to enter on an opponent. Fighters types and techniques are taken from other evolutions and used to disrupt the evolution thats is trained. This teaches the AKP how to enter on an opponents’ attack. Atienza Kali Lock sets and takedown sets can also be use to disrupted evolutions. Once the AKP learns an Evolution, then the individual fighter type parameters and corresponding techniques can be trained within the Atienza Kali Attack and recover set (ARS). ARS are individual sets that consists of a feed that usually lasts 3 to 4 counts long. During this feed the AKP uses individual techniques from the Evo to counter the feed and recover during the feed. By learning how to track and counter a continuous feed they start to learn how it feels to be attacked by multiple opponents, mass attack. The ARS is typically fed at a moderate pace so the AKP can learn the desired set. There is no combat stress in this drill. The focus of the Atienza Kali Real Combat Exercise to introduce and accustom the Atienza Kali Practitioner to the experience of applying Atienza Kali techniques with the energy of a real combat feed. 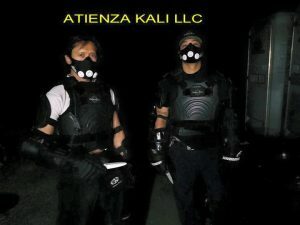 The first thing that new Atienza Kali Practitioners feel within an RCE is the energy of the attack. Many of the high ranking instructors in Atienza Kali have seen real life and death combat situations. They draw from these experiences to deliver a feed that is close to the energy of combat. Thus, the RCE is performed with very high and extremely aggressive energy, as in a real combat exchange. Many of the AKP who haven’t seen combat find their first RCE to be an eye opening experience. Eventually they learn to cope with the energy and aggression of the exercise, and begin to execute, within the RCE, the techniques that they have learned. One of the important purposes of the RCE is to understand how a fight moves. Anyone who has seen combat knows that the fight can move around within its environment. 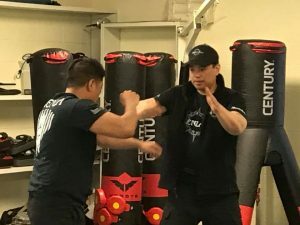 The AKP begins learn how any actual violent encounter can travel and how the corresponding footwork can work in a certain environment. Only when an AKP learns how a fight moves can they learn how to move the fight. This is important when doing Atienza Kali wolf pack tactics. Once the AKP is accustomed to the RCE, then they are introduced to different environmental scenarios. The first scenario they see is uneven terrain. 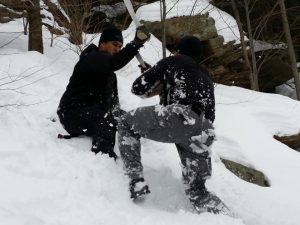 This is usually done on the “MOUNTAIN” (Atienza Kali training site in the Pocono mountains). They train on rocks, uneven, and sloped terrain. Atienza kali footwork is not really understood until this training is experienced. -train in transitional spaces- doorways, etc. -train in home/indoor spaces –stairways, hallways, bathrooms, etc. V Feed– simple feed that consists of forehand backhands and thrusts in various combinations. Represents most of the angle of attacks that one will see on the street or from an untrained attacker. Straight Feed– This feed is an uninterrupted 3 to 4 counts long and represents the feel of multiple opponents attacking, or an aggressive opponent that may not react to the first entries of the AKP (i.e- someone on drugs or alcohol). Interactive Feed– A pause within the feed mimics a reaction to a good entry. The feed continues after the pause. It is important that protective gear be used during RCEs. The Atienza Kali Practitioner must make contact to the attacker. When the feed is close to realistic, the AKP must make hard contact to the attacker and must be accurate to specified targets. Proper protective gear allows this to be done in a safe and consistent manner. Sparring is where the AKP gets deeper into Fighter Type interaction. They start by sparring the high rank instructors in the group. As the session goes on the high rank will usually give analysis to what Fighter Type is being used and what Fighter Type they are using to counter. 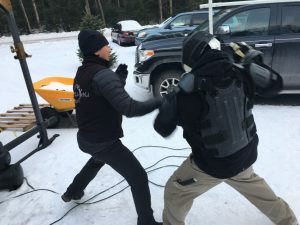 These levels are meant to introduce the AKP to weapons interaction with very little pain- executing techniques in a “vacuum,” executing techniques without the repercussion of pain or injury. Many of the techniques are hard to execute due to the characteristics of the padded stick. Usually The AKP use a few FTs on these levels. On these levels the technical execution is better. The flat sticks work like blades and the detail of attacks and counters are better understood. At level 4 sparring becomes more refined since the possibility of pain and injury are real. The execution of techniques they used in levels 1-3 are refined or not used at all. In the first 3 levels there are a lot of “double kills”. Double kills usually happen when a fighter executes a move or technique with no awareness or regard to the attack or counter of the opponent- poor attack and recover. When pain and injury are a factor, technical execution becomes more refined, due to necessity, and practitioners begin to search for the cleanest entry possible. Level 5 and 6 have the same lessons as 3 and 4. The feel of a live blade comes into play. Technical execution becomes refined. 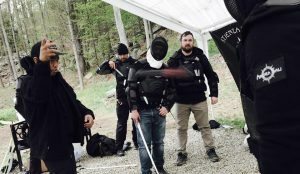 In level 6 the AKP realizes the training blade is not a stick. The damage it can cause to the body is way more significant than a stick. Technical execution becomes refined. Level 7- Live blades – This level is done so the AKP can feel a live blade moving against them. This is also where the custom blades are refined. A practitioner who has made their own blade, or is testing a blade made for them, will spar and run RCEs with an Atienza Custom Blade to fine-tune the balance of the weapon and the fit of the grip. This is important since AKPs have different strengths, hand sizes and use specific fighter types and techniques. No two practitioners are exactly alike, therefore, no two blades are an exact copy of each other.